In the past month, we've received no fewer than 48 requests for cake pop swaps. So we brainstormed, crunched numbers, and toiled away in the kitchen until we created cake pops that are amazingly rich with less than half the fat of similar pops from Starbucks. Yay! Preheat oven to 350 degrees. Spray an 8" X 8" baking pan with nonstick spray and set aside. In a large bowl, combine cake mix, applesauce, and 1/2 cup water. Whisk thoroughly. Transfer batter to baking pan. Bake in the oven until a knife inserted into the center comes out clean, about 35 minutes. Line a large baking sheet with wax/parchment paper and set aside. Remove cake from pan, and transfer to a bowl. Crumble cake into small pieces with your hands. Add Cool Whip and mix well with your hands. The mixture should be moist enough to hold its shape once packed. Transfer half of cake mixture to a non-wooden cutting board, and form into a log of even thickness. Evenly slice widthwise into 12 pieces. Repeat with remaining half of cake mixture, yielding a total of 24 pieces. While assembling pops, dampen hands often to keep cake mixture from sticking. To assemble, flatten 1 piece of cake mixture and place a marshmallow half in the center. Wrap cake mixture around to fully encase the marshmallow half. Roll it around in your hands to form a ball. Place on the baking sheet and repeat with remaining cake mixture pieces and marshmallow halves. Poke a lollipop stick into the top of each cake ball, stopping once the stick reaches the center; repeat with remaining balls. Set aside. Clear a space in your fridge for the baking sheet. Place chocolate chips in a microwave-safe bowl, and microwave at 50 percent power for 45 seconds. Stir and microwave at 50 percent power for 30 more seconds; repeat, as needed, until chocolate is completely melted. 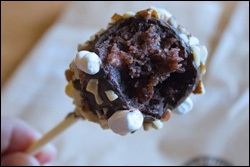 Use a spoon to coat the sides and top of a cake pop with chocolate. Lightly sprinkle with crushed almonds (about 1/4 tsp.). Place back on wax/parchment paper with stick upright. Repeat with remaining ingredients, reheating chocolate at 50 percent power and stirring, if needed. Refrigerate until chocolate has completely hardened, about 40 minutes. Eat up! HG Tip: If your market doesn't carry lollipop/candy sticks, check your local craft store. When it came to putting together a swap for dessert items as small and dense as Starbucks' cake pops, we had to focus up and train hard... Rocky Balboa-style. That's right -- in order to re-create a dessert traditionally made by mashing up cake with frosting and then coating it with chocolate, we had to go all "Eye of the Tiger." (Cue the montage of HG staffers running up stairs, drinking raw Egg Beaters... KIDDING! Gross.) Fine, it wasn't quite that dramatic, but it definitely required some trial and error. And it's all worth it, considering we got perfectly beautiful cake pops as a result. Ours have big marshmallows on the inside! And isn't a gooey marshmallow center superior to dry li'l 'mallows stuck to the outside? Once you make our cake pops, which have less than half the fat of SB's treats, you might find yourself running up some steps with a cake pop hoisted triumphantly over your head. Which isn't weird at all. If your pals are some of the people who wrote in asking for this recipe (or even if they weren't), make sure they see it! Click "Send to a Friend" STAT. It's National Candy Month! 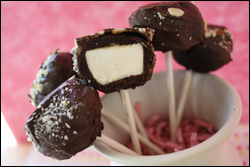 If chocolate-coated, marshmallow-stuffed treats aren't candy-licious enough for you, consider these candy-packed recipes!